Every time I go to the Space Coast Birding and Wildlife Festival I make sure to go out of my way to spend some time with Snail Kites. As a New Yorker, the idea of a raptor that subsists primarily and almost exclusively on snails is utterly foreign to me and I find the idea fascinating. 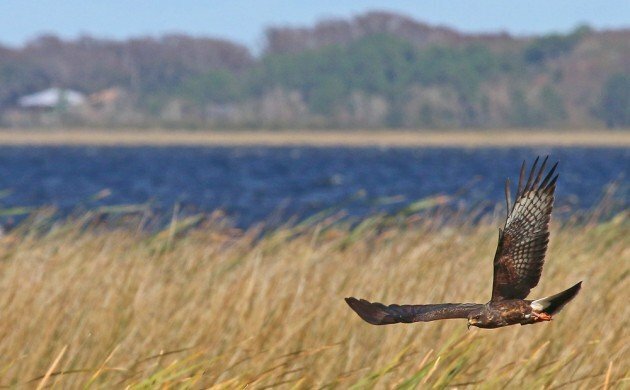 After all, we tend to think of raptors as fast, as powerful, as stealthy. But Snail Kites need none of those attributes. Instead, they need to be able to find snails and, once the snails are found, to get the snail out of the shell. How do they do it? 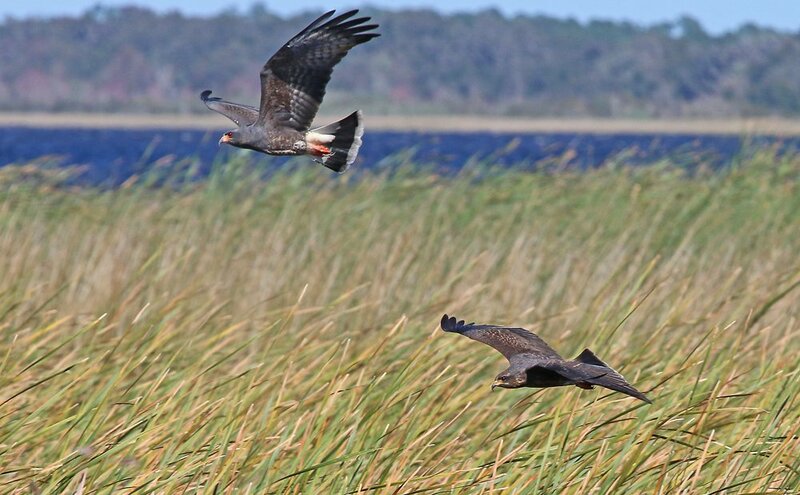 Fortunately for me, my visit to St. Cloud’s Lakefront Park on East Lake Tohopekaliga, was fruitful and I got to watch two different Snail Kites looking for snails. The birds interacted in the air several times and watching their behavior with each other and while they were hunting was educational and enjoyable. 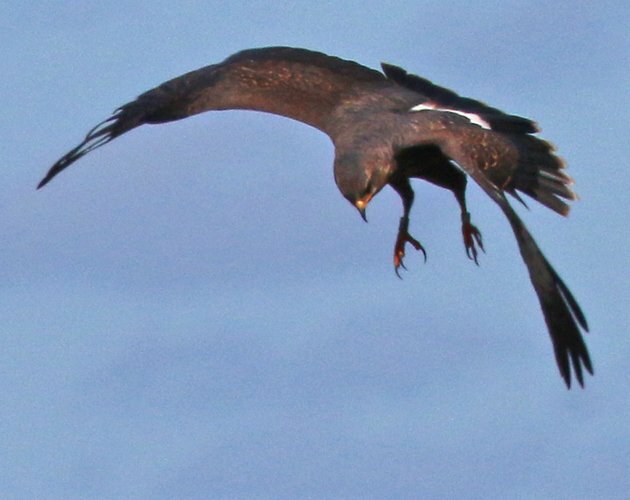 Though I am no expert on Snail Kites and their plumage I am relatively certain that these birds are a young male and a young female. 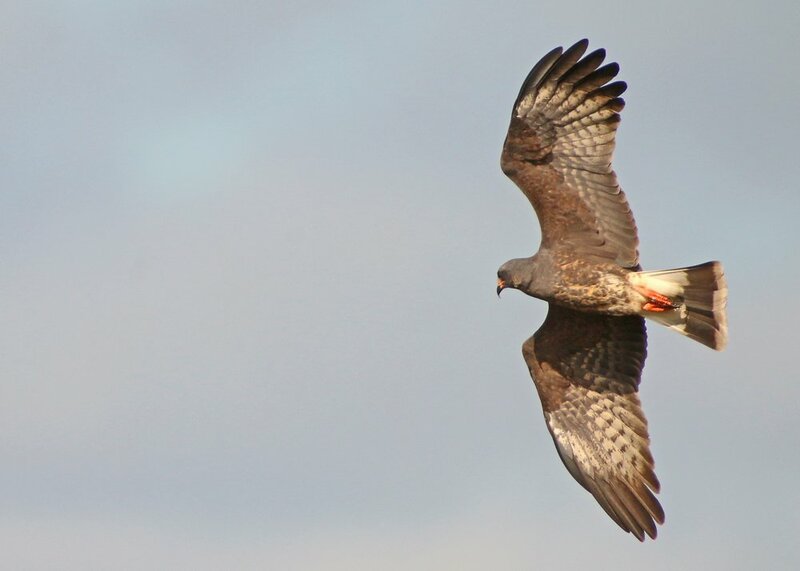 The top bird in the photo above is a male, with the gray plumage that will eventually be its main color only currently covering its head and back. The female, below, might be even younger as she lacks the striped facial pattern that adults females achieve and her bill still has a yellow base. (Adult birds have an orange base to the bill.) But more than the plumage I was interested in the adaptations that these birds have to make them successful at catching snails. Check out the talons (and the bands) in this heavily cropped picture. 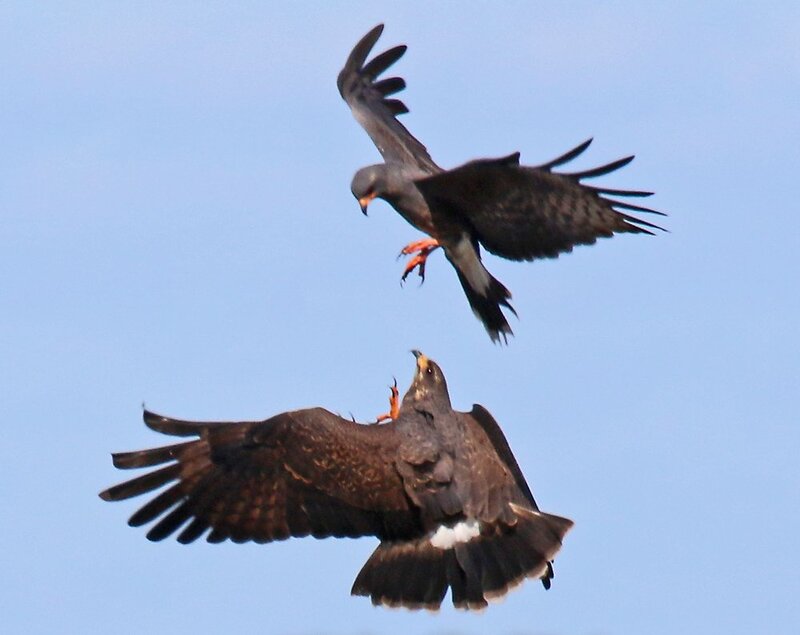 In addition to the their very thin and heavily curved bill, which is perfect for getting into a snail shell and ripping the meat out, Snail Kites also have very thin talons, something I hadn’t realized before digging through the hundreds of shots I took of this pair. It looks like they could use their talons in a way similar to the way they use their bill, to get into the snail shell and sever the body from the shell, but the talons are never used for this purpose. They are, however, useful for pulling snails from the vegetation they are attached to and keeping a grip on the snails in flight. What better than very tough and needle-sharp talons to grab onto and hold a snail while in flight? 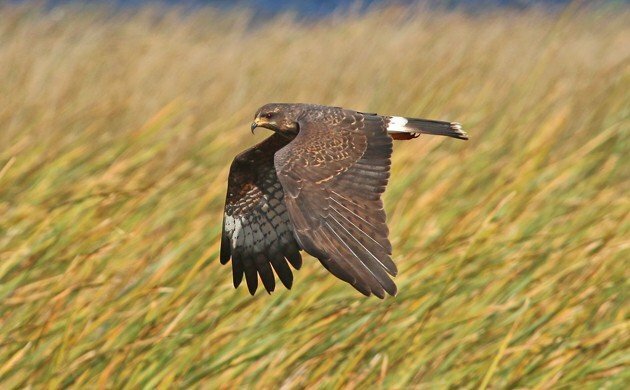 Snail Kites also have very broad wings, the better for catching the wind and holding them in place as they search for snails below them, and also good for pulling them out of the marsh vegetation once they have grabbed a snail. They also have very short and broad tails which I think makes sense when you consider how low to the water they get when snagging a snail. Once they grab the snail and start heading up again a long tail might hit the water or drag in the vegetation while the short, broad tail stays out of the way and is very useful for maneuvering in tight spots. The Snail Kites sparred in the air with each other several times: I just wish I had managed a sharper shot of the behavior. 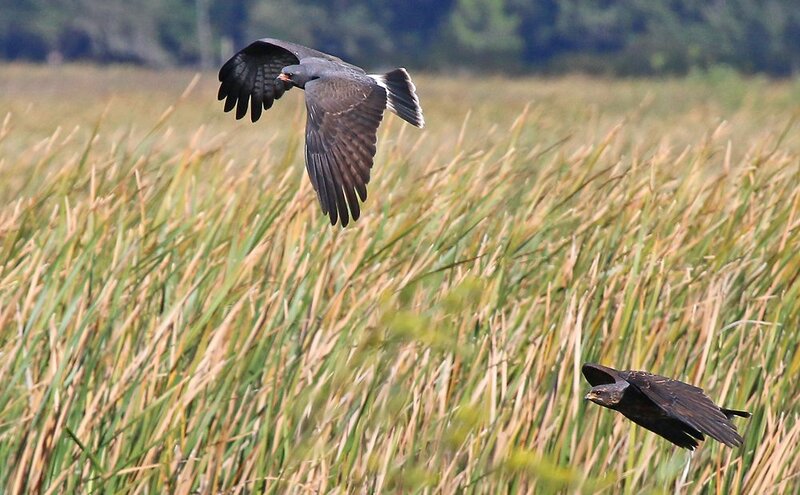 Perfectly adapted for their lifestyle, the Snail Kite is an amazing hawk. My understanding is that the population at East Lake Toho is very carefully monitored which only makes sense considering that the Snail Kite is in decline in Florida though it is a Species of Least Concern internationally. The monitoring is why the female bird is banded, though I didn’t manage to get shots that I could use to read the numbers.